I’ve been doing a fair bit of research to find sources of all the components we’re going to use in our system, so now it’s time to share. I’ll add this as a permanent page too – and try and keep it updated as I find more. If there are any I’ve missed – let me know! First Tunnels – All sizes of polytunnels, plus great info. Or, if you need help, you can always drop us a line here. Not sure whether it’s the joy of finally finding a house for us to settle in for the next decade-or-so, or whether it’s the delight at finding a garden that, due to its orientation and terracing, is perfect for a garden split between agricultural and familial duties. Or is it just that spring is in the air? a glorious spring at that! Whatever it is, my mind is embracing the possiblities of our new situation. A situation that lends itself to a no-holds barred aquaponics system. Gone is my initial timidity. Stuff it, let’s go straight to a BIG system. One that’ll feed the family, and then some. The system starts with the sump and fish tank full of water, and the growbeds empty. A timer turns the pump on – the pump is located in or near the sump. The pump transfers water from the sump to the fishtank. The fishtank overflows, passing water to the growbeds by gravity. The growbeds fill with water, while some starts to flow slowly out of the growbeds to the sump. With the growbeds full, the timer stops the pump, and the fishtank stops overflowing. The water from the growbeds drains under gravity into the sump. So it only needs one pump, a timer, some careful pipework and a sump large enough to handle all of the water from the growbeds. There are three rows of growbeds : Ten that are 4’x2’x12″, and three that are 7’x4’x18″ (although these will only be filled to a depth of 12″). Total growbed volume – 4300 litres. The sump is made up of three interlinked tanks,7’x4’x18″. Total sump volume is 3050 litres. So those are the tech specs, what does it mean for food? This system should provide more than enough fish and non-root veges for a family of four – that’s my estimate, based on other systems I’ve seen. That’s our target – at least from year 2! UK Aquaponics – Greenhouse or Polytunnel? 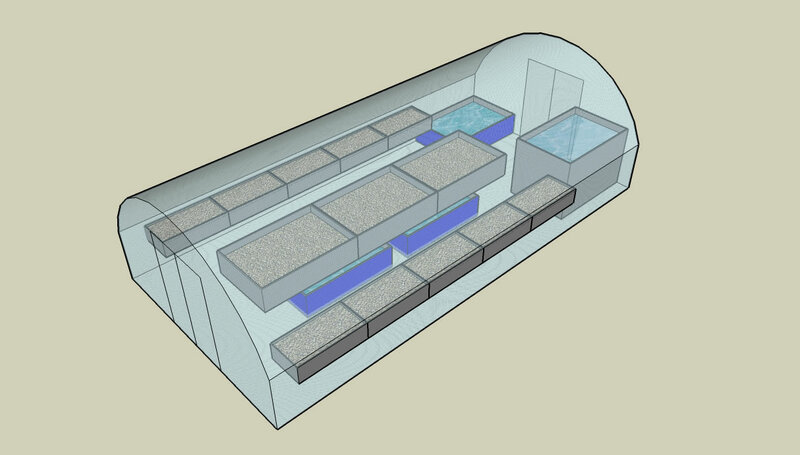 For year-round Aquaponics in a cold-climate like the UK, we’re going to need some sort of enclosure to keep the system from freezing through the winter. We don’t want to have to use any heating unless we absolutely have to, as it’ll quickly make the system uneconomic to run. So the question is . . . do we go for a greenhouse or polytunnel? We’ve never used either before. Visually you’d have to go for a greenhouse, but pound-for-pound you get a bigger enclosure with a polytunnel, and on our budget that’s probably a strong factor. The plastic covering for a polytunnel is relatively easy to tear, lets in less light than glass and it deteriorates so it lets in less light each year. It typically has a lifespan of 5-7 years. Replacing it typically costs only 20% of the price of a new polytunnel, so it probably still ends up cheaper than a greenhouse. Some polytunnels have very low, or no, eaves. This limits their useful width for an aquaponic system with growbeds on stands. Aluminium greenhouse frames conduct heat too well – reducing the insulation effect of the greenhouse. Standard greenhouse glass is thin, and breaks into lots of small shards – very dangerous around our littlies – so we’d have to go for the significantly more expensive toughened glass. What size is best? I’m thinking there’s not much point going wider than 3m – a one metre wide central aisle, with 1m-wide growbeds on either side. Any wider than that and I’ll have trouble reaching across the growbeds. A wide door will be essential, for moving large tanks and growbeds in and out, and door needs to be central, not offset. If we’re going for a polytunnel we”l need one with good straight sides, not one with a continuous curve. Having looked at the prices, we can get good-size polytunnel for £19 per useful sqm, but I’ve struggled to find a greenhouse for much less than £127 per useful sqm. So a polytunnel it is! Just found a great little video showing a two-storey aquaponics setup being built as part of the Incredible Edible Todmorden scheme – really interesting setup – go here and have a look.